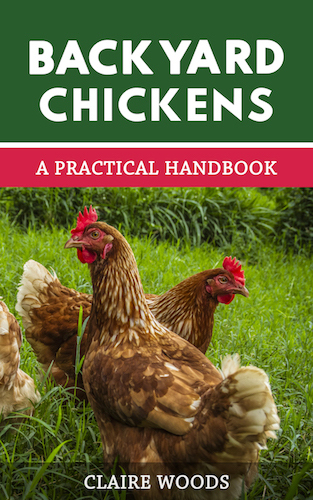 Feeding your chickens is one of, if not, the most important task when it comes to raising backyard chickens. Get it right and you will have a healthy flock who merrily cluck every time you bring them one of their favourite snacks or kitchen scraps! Get it wrong, and it can lead to reduced egg production, deformed eggs, feather picking and other unwanted behaviour. So, let’s gets straight into all you need to know about feeding chickens. What Should You Feed Chickens? 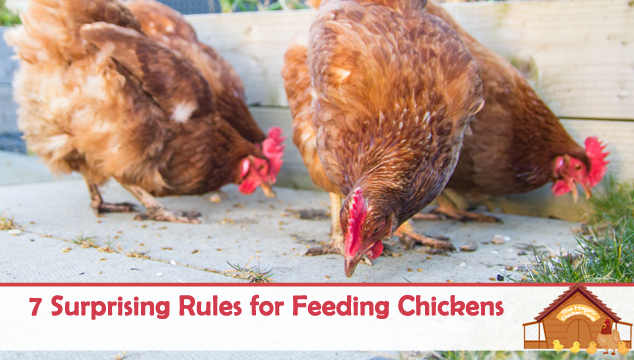 Once you know what you’re doing, feeding your chickens is quite straight forward. We think what makes it tricky are some of the false myths posted online about what you can and can’t feed your chickens (such as feeding your chickens potato skin is bad for them- this is false! Chickens love potato skin). The basis of any good chicken diet is a high quality poultry pellet (source). We feed our girls layers pellets which provide them with the right amount of protein and minerals to keep them laying eggs! Pellets normally contain: wheat, salt, maize, sunflower seed and oats. Feeding your chickens pellets ensures that they are getting vital vitamins, nutrients and minerals form their food source to keep them healthy. This is even more important if your girls don’t have much outdoor space- because they won’t be able to get minerals and salt from the ground. In addition to their core diet of pellets you can feed them grains such as corn or wheat to give them some variety. Chickens love fruit and vegetables and you can give them this daily. Our girls love: vegetable peels, bananas, apple cores, carrots and broccoli. You are safe to feed chickens pretty much any vegetable or fruit except any raw green peels (such as green potato peel) and any citric fruits such as oranges and lemons. Just remember they need whole grain, low salt and low sugar foods. Does this mean you can’t feed them scraps from your dinner? Absolutely not, we discuss which kitchen scraps we give our girls later on in the article. 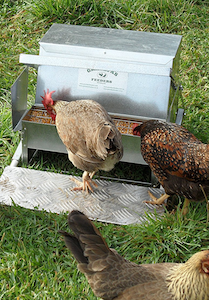 Before we move on to discuss how to feed your chickens let’s finish this section by discussing how you can ensure you are feeding your hens a high quality feed. Your feed should be high in protein, organic, and ideally milled in the US. A good quality feed will ensure your hens are healthy and laying eggs. We have shared some of our favourite feeds in the table below. So now you know what you should be feeding your chickens the next question is how should you feed them? We feed our chickens pellets once in the morning and once in the evening- remember they like to eat small portions but often. Some people prefer to throw chicken pellet straight onto the floor and let their chickens peck at it there. We put our pellets into a chicken trough to keep them clean and dry. Generally free-range chickens won’t over eat so you can’t over face them. If you put too many pellets in their feeder they simply won’t eat them. Be careful to make sure not to leave any pellets or feed out overnight because this will attract pests such as mice. 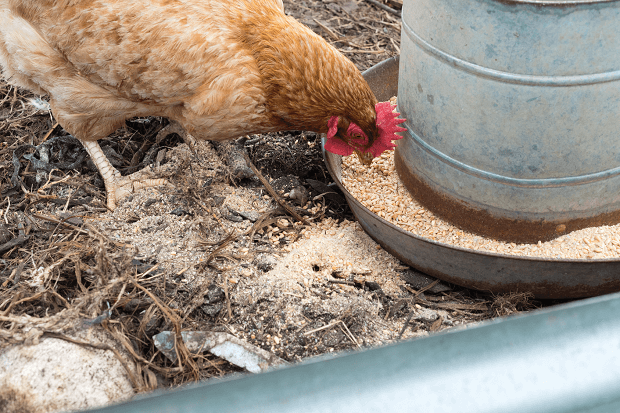 Over time you will learn exactly how much feed your chickens need and this will depend on the breed, how active they are and the time of the year. If you are constantly finding feed in the trough then reduce the amount you give them slightly. We have 12 hybrids and find that 4 large handfuls each morning and evening keep them happy. Interesting side-note: a hen needs roughly 4 pounds of chicken feed to produce 12 eggs (source). This will depend more on your circumstances than on the chickens. If you are retired or spend the majority of your time at home then you can feed them pellets several times throughout the day. However if you work or are away from your home throughout the day then you are best feeding them once in the morning and then again during the evening when you’re back home. One thing to keep an eye on whilst you are feeding them is to make sure the most dominant (remember our discussion on the pecking order?) hens don’t eat all the food. If this is becoming an issue consider feeding the weaker birds on their own to ensure they get some food. Providing your hens with water is very straight forward, you just need to make sure they have access to clean, fresh water at all times. During the winter if you live in a colder climate, the water will probably freeze over during the evenings, so just make sure to break the ice up and clean out the bowl in the mornings. Of course no chicken feeding discussion is ever complete without discussing table/kitchen scraps. One of the many benefits of keeping chickens is that the vast majority of your kitchen waste can be fed to them. This means they get a varied diet and you get to save some money! Make sure to try and feed your chickens wholesome foods, such as rice, pasta, oats, fruits, vegetables and wholemeal bread. As a general rule if you can eat it so can they. However this excludes any fatty foods or foods with lots of salt in. When we feed our girls scraps we tend to just cut it up into small (thumbnail sized) pieces and throw this straight onto the floor into their pen. We only place pellets in their trough. You’d be amazed at some of the scraps your chickens eat- pizza, spaghetti and porridge to name a few! Before you feed your chickens kitchen scraps, make sure to check your local regulations as in certain places (such as the UK) this can surprisingly be illegal. Worms: They absolutely love worms. Pumpkin: This includes pumpkin seeds. Apple Cores: Just throw the apple cores straight into the pen. Broccoli: For some reason they can’t get enough of it! Porridge: They only eat this during the winter months though. We’ve covered lots of food throughout the article that you shouldn’t feed chickens so we won’t repeat them again. Other foods you shouldn’t feed chickens include: avocado, rhubarb, garlic, sweets, and any heavily processed food (i.e. crisps). Just remember, as a general rule, if you can eat it so can chickens. What Can Happen if Their Diet Isn’t Right? A great email we received from a reader last week was ‘how do I tell if my chickens’ diet isn’t right’? The first thing to say is, if you noticed a significant change to their eating habits, be sure to get a vet to look at them as soon as possible. However, if their diet isn’t right there will be certain signs such as. Recued egg production: If the season hasn’t changed and their egg production changes significantly this could indicate something is wrong with their diet. General unrest and feather picking: Again, if the season hasn’t changed and they are picking their feather or each other’s this could mean their diet isn’t correct. Abnormal eggs: if you are finding that the eggs they do lay are too small or consistently contain double yolks, then this would indicate their diet isn’t right. If you are looking for a handy cheatsheet, be sure to check out this, which was produced by the Australian Government’s Agricultural department. Let us know what your chicken’s favourite treat is in the comments below. Good article but actually white potatoes – all parts- contain the toxin solanine and should be avoided. Garlic is fine for chickens in moderation – mine get garlic powder added to their feed daily. And apple seeds contain cyanide, so feeding chickens apple cores isn’t really such a good idea. My suggestions come directly from the Merck Vet Manual – which is what I use as a guide in most cases. Hi Lisa thanks for getting in touch! When white potatoes are green it indicates the the toxin you mentioned, solanine, is present- However if it isn’t green it should be ok.
We didn’t know about cyanide in apple seeds and we’ve just checked. Supposedly apple seeds contain around 0.6mg of cyanide per seed- so they would need to eat an awful lot of seeds to get poisoned but better to be safe than sorry! Sorry girls, looks like no more apples for you! I core my apples and chop them up and mix in oatmeal and unsalted sunflower seeds, my girls love it! My problem is my two Plymouth bared rocks and one Rhode Island red are getting their feathers on thier breastfeeding down to their butts plucked out and their skin is red the other Rhode Island red is as pretty as a picture! Is she bulling? Was it the root in its entirety? You can still give your girls apples, just dont give them the apple cores. Just smack the cores to a hard surface and most seeds just pop out. Even so, a tiny amount of cyanide won’t kill them and if it did it would do so acute. It is higher then average levels of cyanide in apricot pits not arsenic. Actually the cyanide in apple seeds prevent cancer, a small amount can be good for humans so why not other animals? I haven’t had chickens in a long time so I forget some of the food basics, there’s the chick feed and then when do you wean them over to layer? Like 17-18 weeks? Why is it so important to keep them on chick feed? Does it contain special protein %s? Surely if chickens enjoy apple cores, it’s a simple solution of removing the pips ? A little effort for their enjoyment would be suffice. I have to say, I got alot from important information from this article, thank you, Happy Chicken Coop. Excuse me for knowing, but apple seeds, just like apricot seeds contain a minimal amount of NOT DANGEROUS cyanide. It’s well known that the Hunza people of the Himalayas lived to well over 100 years and enjoyed working all their lives, and they ate the pits of apricots religiously. It’s the medical profession’s ignorance of “foods being ones medicine” that prompts such advice. In fact, I always eat the seeds of an apple when given the opportunity. They are a compliment to good health, and not to be feared. Feeding my my old lady hen [house hen] broccoli is that cooked or raw? Also are grapes all right to give to her she loves them I limit her to about three or four a day is that too many? I make an effort not to kill her with kindness but she is well loved and a real character. Her name is Jeany she is xbat. Oh yes grapes are fine 🙂 Here is a little trick I use to spread them out- just slice the grapes in half so it keeps them occupied for a longer period of time! How do I know my birds are getting enough grit? We just got our first 4 hens last night and their run is grass. We are feeding them layered pellets cuz they are 7 months and laying. I want to make sure they are getting enough grit to digest but I’m not sure how to tell? Are there any indicator? Grit helps them digest food. To help make shells, you want oyster shell as a supplement. If they are free range, they are probably getting enough grit. If not, keep some available. As with the oyster shells, they will take what they need. My chickens free range starting at around 7 a.m. and go in around 6p.m. They barely eat any pellets. They get mealworms as a snack in the a.m. I live in Florida so there are plenty of bugs. One of my Buff Orpingtons layed a soft shell egg 3 days ago. They get ACV in there water and have plain water available at all times. When it’s extremely hot I give them electrolyte, vitamin, probiotic water. My hen is in no distress. I bake and then finely grind my hens used shells. I keep the powder in a jar and add it to their feed. Works great as grit and it’s free. How much grit does a free range rooster need? I have 4 hens- raised from chicks. Do I feed them laying pellets only or as a supplement? I would feed them laying pellets as their primary diet and then give them snacks and treats as a supplement! Advisable to feed layer ration only when they start laying not before as it will be too much protein, I have been told by vets and at conferences. Also advised to NOT feed layer ration to males as it can cause blockages. Best to feed males a finisher ration. Thank you for sharing this Siquala! Hi, how do u keeep ur rooster on a separate diet if he’s in the coop with thr ladies? I find mine has his head in the feeder an awful lot. I can’t separate them at feeding time. If they are in the same coop you can’t keep them on a separate diet. Unless, you separate him each time they feed and opt to restrict their feeding to certain hours of the day. It depends how much water there is- you definitely don’t want it to be like a pond! As long as it’s just a bit damp and there is no lasting surface water then they will be fine. I’m currently making an analysis of our organic waste to see if I can optimize things. It’s strange that I couldn’t find any feeding article yet that says you can’t feed chicken meat waste to chickens. For some people this may seem obvious, but it still makes me wonder, isn’t it illegal to do so in many countries? Also, a lot of articles say you shouldn’t feed chickens more than 20% of their diet with organic waste, so 80% is purchased food, what is your advice? The only difficulty I see with feeding chickens organic waste is being able to calculate exactly how much nutrition they are getting. You sprinkle it on them. I just saw a video that said to put garlic bulbs in their water for get rid off and keep mites from returning. One bulb per gallon of water, two if the bulbs are small. the only worry with garlic is too much will lead to garlicy eggs. Otherwise that sounds a good tip. Thank you. Diatomaceous earth is good to dust on them too. Natural and does no harm if it is eaten, in fact, if eaten it should also take care of worms as it works like broken glass when it touches/is ingested by the worms but not larger creatures. hi may I know the time intervals to feed my chicken every day? thanks? What about onions in the chickens diet? I had read under ground food is not good for the chickens diet. They can technically eat onions but the taste can spread into the eggs, so I wouldn’t recommend it! By reading this article, questions, comments and suggestions has been very helpful. Just 4 days ago I purchased 5 hens whereas I have gathered 6 eggs thus far. How do I know which hens are laying? There are 3 RIR and 2 white hens. Unless you sit and watch them in and out of the nest box it’s difficult. However, your RIR’s will lay brown eggs whereas your white hens (presuming they are leghorns) will lay white eggs. I’m starting my 1st flock this year. I’ve decided on RIR & Longhorns. This may be a stupid question but if I only have RIR Roo will the Longhorns still lay white eggs? Hi, should I boil all veg before giving it to my chickens? How much meal worms should I fees to four hens? I raise both large,which are about an inch long, , and super worms that are about two inches long. A handful as a treat will be plenty! My hens are 18 weeks old, when will the hens start laying eggs? You should be expecting eggs within the next 4 weeks or so! Can I grind up their egg shells and feed them back to the girls? Also what about meat scraps? Is that ok to feed them? yes ,you can,I do this from the beginning.I just place in the microwave for 3-4 minutes or in oven high temp for 5-10 minutes,after that I grind ,is powder,they love it. I save all the shells,I wash and let dry. My problems is the pallets,I have organic pallets ,very expensive ,but they wouldn’t touch,get on my last nerve.No more treats ,for sure. I’ve seen chicks as young as a few days old eating mealworms- so you can’t really give them snacks ‘too young’. I don’t give the baby chicks treats. i give momma hen the treats and she distributes the treats accordingly. It’s so cute!! This sounds so cute Allen! I feed my girls, a lot of different things, but never spaghetti ha ha! Is it ok to feed your chickens vegetable leaves, carrot tops, beetroot leaves, broccoli leaves? Yes. A simple rule of thumb to help you is if you can eat it, so can your hen! No you shouldn’t feed them overnight. Hi. I have 3 Americanas, 1 white leghorn, and 3 Production Reds. (Not sure if that is related to RI Reds or not.) I have been feeding layer crumbles. What is the difference between the layer crumbles and layer pellets? Not really any nutritional difference. I have a chicken that just showed up in my yard and has adopted me. No one has been able to catch her as she is incredibly fast, but she always come back to me so looks like I have a chicken. I have grown attached to her & want to care for her in healthy / positive ways so thank you all for your input on feeding chickens. Not a problem, I’m happy the website is helping you! We have been feeding our 8 chickens grain mixes (can’t get pellets near us in Spain) and I have also been giving them mung bean sprouts and sprouted rye and oats which have grass on them every 3 or 4 days. They also get spinach, lettuce and any left over veg. They rush over to the corner of their run whenever they see us and some days if we are out often we don’t get many eggs. We wondered if we gave them enough food once a day, they would not always be thinking of treats every time they see us. Any advice please, we are beginners. Even when my girls are full they still rush over to me thinking there are more treats coming- I don’t think it’s something you can stop! I love when my RIR runs to me when she sees me. The only thing I do not like is that she wants to peck the nail polish off my toes!!!! Do chickens like a wet mushy feed for variety, any problems with it? I read that garlic is a natural way to kill any internal parasites in chickens. Recommendation was to feed minced garlic 2-4 times per year.Is this true? Do you mean that you will mush up their pellets? My Chickens LOVE Popcorn. Is this okay for them? Just make sure not to over do it! I have 4 chickens which I was given when they were small about 12 weeks old, They are now about 9 months old. I found your web site incredibly helpful in giving me advise on food and wellbeing. My chickens are now huge but as yet have not started laying. I was told this could be because they were growing during the winter months and therefore may not start to lay till spring, Could this be the reason or have I not done something I should have. They are feed layers pellets twice a day mixed grit weekly and corn and scraps as a treat. They seem in good spirits and seem happy. Hi. I’m also a new chicken mommy. Your site and information has helped tons. I have 5 and they are now 13 weeks. Since I’m not getting eggs yet my most favorite time is when they greet me at the pin door. Hope they start laying for you soon! What a great discussion! Found kaboodles of info on here pertaining to feed and general upkeep, in the comments. Thanks, champs! This site has given me so much information. Do you give the chickens uncooked or cooked rice? Also, Old fashioned oatmeal is ok? I am just starting to research raising chickens and have found your site and the Q&A very helpful. One of my concerns is going out of town for a couple of days once in awhile. Can they be left with sufficient food and water? The biggest problem you will find with this is not being able to lock their coop at night- this is crucial as predators will attack at night time. Is it possible a friend could come over at night to lock the coop up? Our 7 girls are about 4 years old and we are only getting about 3-4 eggs a day instead of 6-7 a day. We have a trough full of high quality chook food available at all times but also give them a tray of scraps each day that usually contains a lot of greens such as spinach or silverbeet, cooked rice, a bit of bread and some sort of meat such as sausages, steak, roast, curry etc..
We’ve ‘heard’ that the meat will be stopping them from laying… seeking some advice please… it’s getting expensive to feed them for no eggs as a result..
Chickens lay the most eggs their first year. The second year they lay less eggs, but they are larger. The third year and thereafter they lay even less eggs with no increase in size. I had a hen that was nine years old and only laid about eighteen eggs the last five years. Any ideas would be welcome on how to build our 1st chicken coop. We live in Scotland so temperatures in the winter can be -10. Thank you, have read your blog, very interesting. I love to watch my girls when I add minnows to a shallow water pan. They are so fun to watch when they go fishing and when they catch one, they can’t just eat it, they run around the yard which alerts the others that they have something and the chase is ON. ? The fisher-hen eventually will put the minnow down to look at it and immediately it will be snatched up by another hen to keep the chase going. We have a mix of different breeds- they are very sweet. We have never cooked any of the peels/scraps we have fed them. Is it okay either way? Ive been reading about adding water to there feed and making a mash. It forments it. Ive been trying it. But my egg production has gone down. So its back to the dry feed.I have a lot of herbs in there feed and think that may not work in the mash… like garlic, oregano, parsley… Anyway Ive dropped from 14 eggs a day to about 10… Don’t think I want to keep trying this. It says that it better for the chickens. less poop…. any ideas. I have 8 chicks, 1 month old. they love broccoli but I’m not sure how often I can give it to them. I have tried other fruit and vegetables but they don’t like banana, apples, cucumber and tomatoes but they follow me for broccoli !! In there any alternatives to pellets? I really want to have truly organic eggs and most pellets are just not really great about ingredients. 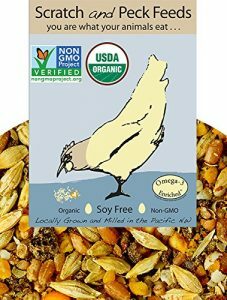 Is there a way to feed chickens unprocessed feed? What would it be? Yes there are alternatives. Ask at your local pet feed store for organic poultry feed. I heard that chickens like a dirt or sand bath to keep pest away. What type of dirt or sand should I put in their dirt bath container? My granddaughter recently got 4 chicks (I believe they are White Leghorns) from her school. So, now I’m the proud owner of chickens. I really appreciate the information on your site as I have never raised chickens. I have a lot to learn, but wanted to make sure the new chicks, now 4 weeks old, are started out right. Should I leave food out for them at night? This is a personal decision, however I personally don’t provide feed over night. My chickens love crickets & snails in shells. Snails used to eat my garden now the chickens eat them. I buy live meal worms at pet store… Once in while they find a lizard in the yard & chase the winner. Also a garden snake which they played tug of war. When we have hot days I give them frozen corn. I bought them a blue plastic pool but they don’t seem to like it, yet. Leave the door open and when you go to feed them in the morning place the food well within the coop and leave water for them also inside the coop. I have trained my girls to come eat when I ring the dinner gong. Ring it every time you feed them. Soon they will come running when they hear the gong. Then at nighrt you can close the door on them while they are feeding, just be sure the have somewhere to roost. Chickens should eat the same as wild ground feeding birds like quail and pheasant. Greens and all kinds of worms-bugs should be the major diet. Corn and soy is hard on their liver and probably wheat too. Table scraps are fine occasionally. We seem to change animals diets to keep it cheap and convenient for us. Its just not right. My chickens wouldn’t go in their house either, we purchased an automatic chicken door opener, put them in their coop with the door closed and set the timer to open at 6am and close at 8pm. The smarter chickens taught the slow learning ones when to come in and out and now they all go in before the door closes at 8pm! Also keeps them safe from predators! It’s super funny watching them line up and enter the coop. That’s a brilliant tip, hoping to get chickens in the near future and think this is a great idea! It’s amazing that they’re teaching each other ? My chickens love left over watermelon. They go crazy over it. Any problems with feeding them watermelon? No problems with watermelon Tony! Thanks for all the info. Its great. I too am just starting with chickens as they were a gift. I feed them as you recommend. Yesterday one of the hens(I only have 9 hens) eat one of the eggs. What should I do? I have bought 4 ISA Browns in the last fortnight and am still discovering what they like to eat. Interestingly I put a whole half pepper in their run and they took no notice of it but when I blitzed the pepper in the food processor and put it back in their run some came straight over and started pecking it up! They also like runner beans blitzed in the food processor and lightly boiled in some water to make a sort of mash. Hi there, I have 6 baby chickens, They are 5 days old, I feed them smashed corn, the problem is they waste most of the food by throwing them away with their feet, how do I stop them from wasting food? Brilliant information. I’ve got ex batts and they give me hours of pleasure. If they can’t come out of the run,if weather is bad or I’m out I have given mine a small amount of Cat food with their pellet. (Beef pate).They love it. My vet said in small amounts there’s no problem. got a great amount of info from your blog and question section!! When you feed your chickens vegetable scraps,like broccoli, is it ok if the vegetables are cooked? Or, do they prefer raw vegetables? I just became a chicken owner because I have been chosen by the chicken. She showed up in our yard about ten days ago and seems to have moved in. I have ordered a coop. I don’t want her to get hurt by the local cat. Is it okay to keep just one chicken? I keep an active compost pile and add green waste and kitchen scrapes and turn it regularly. The chickens watch me turn it and then start scratching. It is full of bugs and the chickens love to scratch for them. Chickens will eat almost everything. The rooster stands on top of the pile. And they take dirt baths around it. Mahalo. We just throw whole apples out into the run for our girls. They have never had an issue from seeds and they have fun rolling them around! Merry Christmas!! Wow, found this site by accident and was amazed by all the information you provided ❤️🤙 I am soon to have 4baby chicks!! A little intimidated by the cost. About how much are you paying a month? Also I saw that you offered to have others email when they start raising chickens, can you email me so I can put it on file? And lastly thank you, this obviously took a lot of time and love. I just want to be the best chicken mama ❤️ Much appreciated, also I live on big island have you had others from Hawaii contact you? Are there any major differences? I am picking up my 12 20 week old pullets up this saturday and by reading some coments i have only bought Layers pellets and oyster shell for their daily food. Do i just mix in the oyster shell with the pellets every day? Oyster shells should be presented separately and they will peck at them at will. I have fresh water in her bowl but she seems to drink from little puddles in the ground as it spills. What do I do? I really love her and what to make sure she is healthy and happy. We don’t have chickens but love all types of animal. We see a group of hens and a rooster when we are dog walking and they all come running up to us looking for treats. Having checked with their owner he would be quite happy for us to give them a bit of something when we are passing. So I couldn’t believe it when I was looking for chicken food on my computer and your site/article popped up. I cant thank you enough for the info which has given me lots of ideas for tasty chicken treats!!! Ps I want to come back as one of your birds!! My 6 girls have seemed to stop eating their feed. We have been feeding the Scratch and Peck Layer since they started laying. Now they seem to be boycotting. They do get greens daily and still eat that but not much feed. Any tips? They can boycott all they want, but they will not starve trust me 🙂 Let them pick and choose until they are hungry and do not have a choice. But, before that, first make sure your food is still fresh and theres nothing rotten about it. I have gone through your article’s and few mail from customers. I really wish to start a layer business, just with 25 numbers of layers (about to lay or just starting layering). Please, what will be your advice or what do I need to know before starting. 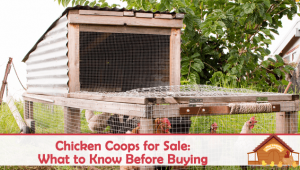 Yes, read this article for tips on getting your chickens to start producing. I got a chick from a friend not knowing what all I was getting into. I have educated myself and like having my chicken. She is sweet and sits in our laps often. I have two questions. One, should I get another one? I read now that chickens are social and get lonely. Will she be alright with me and my kids or does she need a chicken friend? Two, I read an article about salmonella and am now paranoid about it. Is this really an issue? Chickens are flock type, I would provide her at least one companion. Salmonella is a lingering fear many people have, proper hygiene and proper coop care and you will be just fine. My 4 black stars eat a whole bunch of kale every day and also love carrot tops and lettuce. Laying pellets and kitchen scraps daily. Free range during the day with their best friends Poppy the dog and two cats who sometimes sneak a nap in the nest boxes.